Cocktailiana » Blog Archive » What America Needs Now is a Drink! What America Needs Now is a Drink! 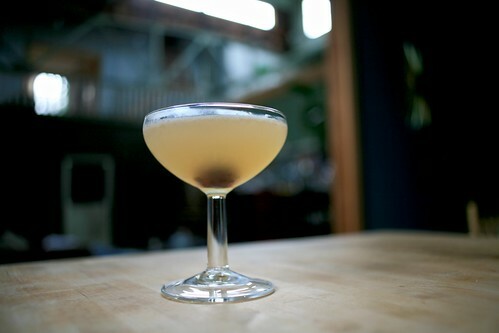 Let us soothe our troubles and hoist a drink in celebration of repeal day! One of the most famous phrases in prohibition lore is certainly the best. On December 5th 1933 at 4:31pm President Franklin D. Roosevelt toasted the end of prohibition – American cocktailiana’s darkest 13 years – with the phrase “What America Needs Now is a Drink”. Bear in mind, that this was in one of the deepest parts of the depression, with millions of people out of jobs and the economy in tatters, Americans needed a drink for so many reasons. One of the lesser known details of prohibition is what Roosevelt was drinking while toasting the end of the noble experiment. Supposedly he signed the 21st amendment and made his favorite cocktail, the Dirty Martini. I can’t say I am the biggest fan of the dirty martini but in the interest of history here is the recipe. Shake gin, vermouth and olive brine with ice, rim the glass with twist and strain drink into glass. Garnish with olive. The problem is that there is some debate as to weather or not this actually happened. Most accounts (including by his secretary) say so, but like most cocktail history there is always a bit of haze around this. Another story is that his famous quote was accompanied by a toast with Korbel Sec Champagne. Korbel was one of the few American sparkling wine vineyards to survive prohibition and they sent the first post-prohibition case to the White House for the celebration. They claim on the tour at the winery that he did in fact toast the end with a glass of Korbel Sec. Incidentally, I don’t normally recommend Korbel Champagnes, but the Sec is their original recipe from the 19th century and it is only available at the winery or online. I like it quite a bit, in fact it is the champagne we had at our wedding. While the Dirty Martini isn’t really my preferred tipple, and I don’t currently have any Korbel Sec available to me without a 2 hour drive, I do have plans to make up a selection of classics as well as some Corpse Reviver #2′s. Shake all ingredients with ice and strain into a chilled cocktail glass. Garnish with a cherry. And so here we are 75 years later, cocktaildom is only now really recovering from the effects of prohibition, bartenders have finally rediscovered the drinks, ingredients, rituals and mythologies of the golden age of cocktails. There surely are parallels now to that December 5th 75 years ago, an immensely fragile economy, with many people concerned about the future, a charismatic new president fueled by hope. I can think of nothing more appropriate than his toast that so many people were anxiously awaiting… “What America Needs Now is a Drink!”. So make sure on Friday to celebrate Repeal Day, and raise a glass for your constitutional right to drink! This entry was posted on Wednesday, December 3rd, 2008 at 4:22 pm	and is filed under Cocktails, Recipes. You can follow any responses to this entry through the RSS 2.0 feed. Both comments and pings are currently closed. Cocktailiana is maintained by Paul Cloutier as a good excuse for him to keep making drinks on a daily basis, and and as a way to get feedback from friends on making more and more interesting drinks.